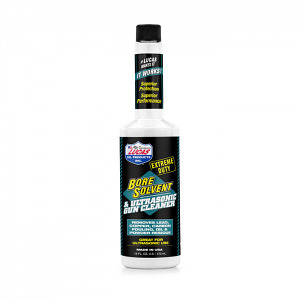 Used and recommended by gun manufacturers throughout the industry, Lucas Extreme Duty Bore Solvent is a special blend of cleaning solvents and corrosion inhibitors. It easily removes carbon and powder residue as well as copper and lead fouling from cylinders and barrels. The specially developed formula cleans deep to remove old oils and grease while providing a thin layer of rust and corrosion inhibitor on metal surfaces. Safe to use on polymers and factory applied firearm finishes. Lucas Extreme Duty Bore Solvent is also designed to work in ultrasonic cleaners due to its high flash point of 210° F and requires no mixing, rinsing or oil dip after ultrasonic use. Made in the U.S.A. 16oz bottle.